Words by Cherie Hu. This article starts a three-part series about how and why artists should develop separate strategies for major social platforms. We begin with Instagram strategy. For many indie and DIY artists, social media presents a daunting challenge. How can someone possibly manage a consistent posting schedule and stay accessible to fans across a growing number of fragmented platforms? How can someone possibly do that and dedicate enough time to writing the great music that brought these fans here in the first place? Instagram, Facebook and Twitter each offer a unique set of features, algorithms and user bases. As such, each platform deserves a unique game plan. To nail social media, consider the following steps. Take time to research who your fans are. Prioritize your platforms based on what those fans prefer. Tailor your content to those platforms for optimized engagement. Avoid the temptation of blind scaling and mass distribution. 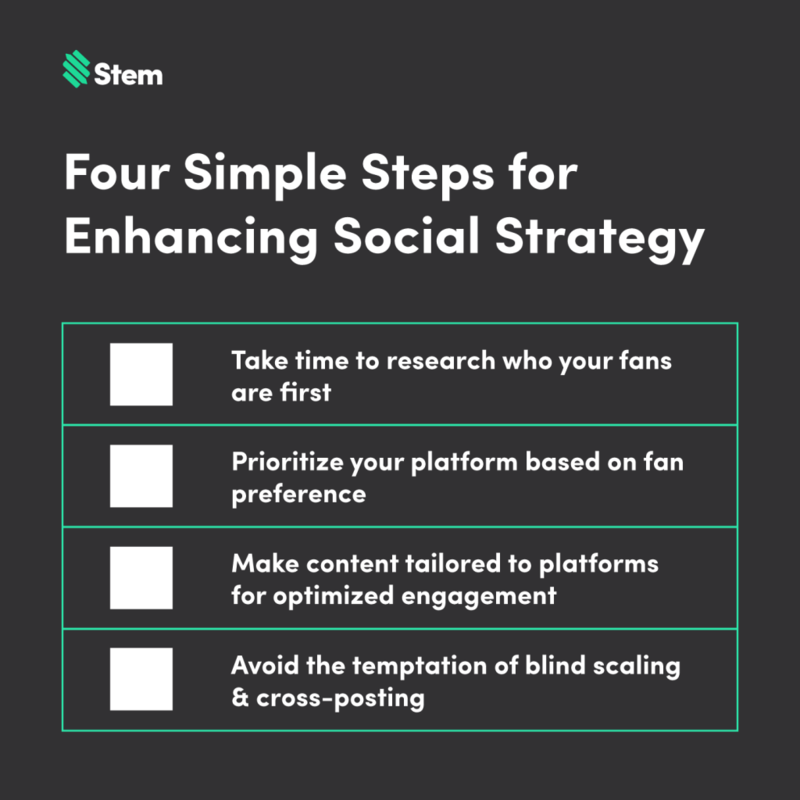 Stem is here to help you make sense of social strategy. Below, you’ll find actionable tips for how artists can engage with their fans using unique, platform-specific strengths. These strategies and examples elevate, rather than sacrifice, creative integrity and translate online connections into tangible, sustainable revenue. 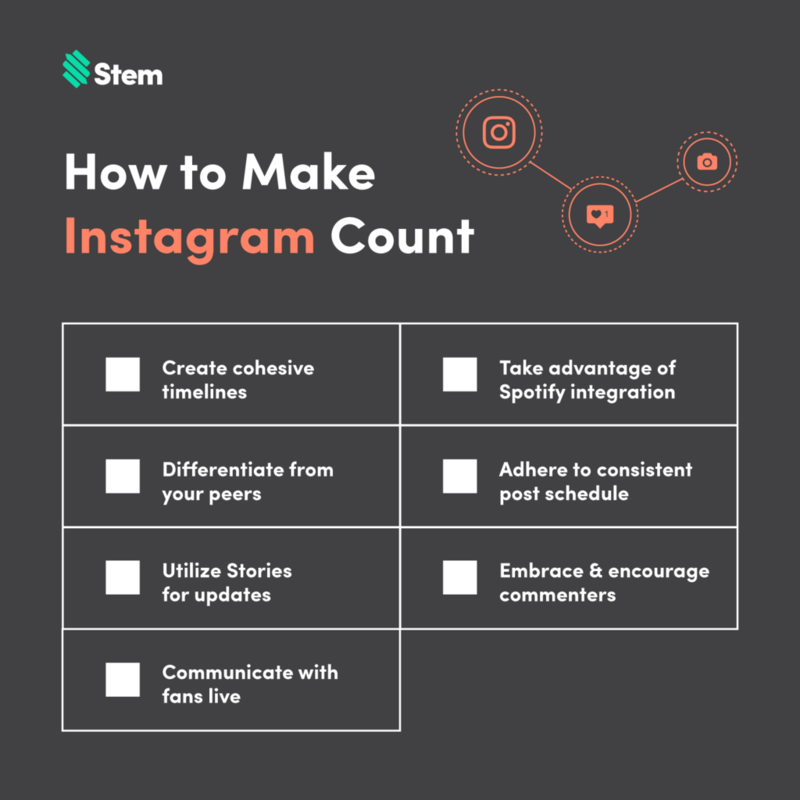 The series begins with Instagram strategy. As a visual-first platform with over 800 million monthly active users, Instagram is the social-media outlet of choice for artists who want to share a distinct visual brand with a captive fanbase. In fact, many users treat Instagram like Pinterest. They can assemble their own visual “mood boards” or “vision boards” using snapshots of everyday events and inspirations, with the ability to browse and bookmark others’ mood boards as well. 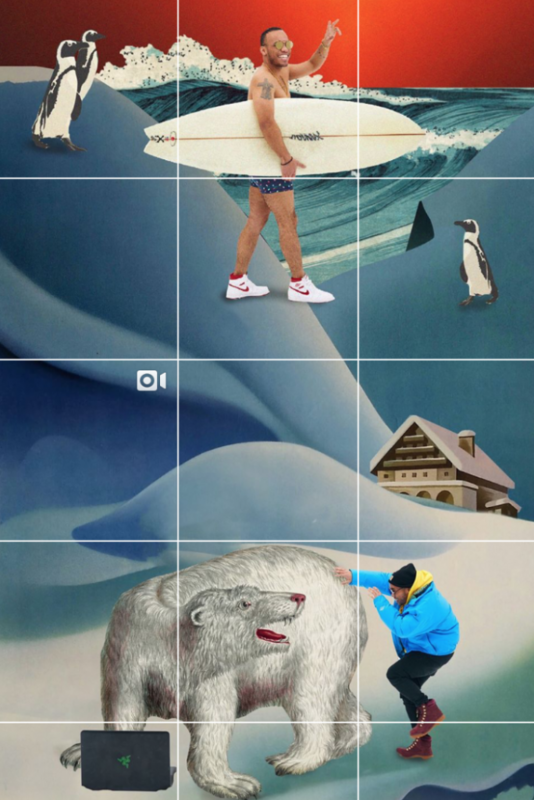 As an artist, your public Instagram profile should reflect this use case: within the first two rows of your profile’s grid layout, fans should instantly get a sense of your personality and visual aesthetic. Two examples of artists who nail this visual immediacy on Instagram are Saba and Anderson .Paak. We’ll look to them as case studies. Here are some examples of high-level Instagram strategy execution. Saba’s latest album CARE FOR ME contains somber meditation on themes ranging from death and solitude to the perils of celebrity culture. The album’s cover featured a stark black-and-white photo of Saba sitting alone on a kitchen table. 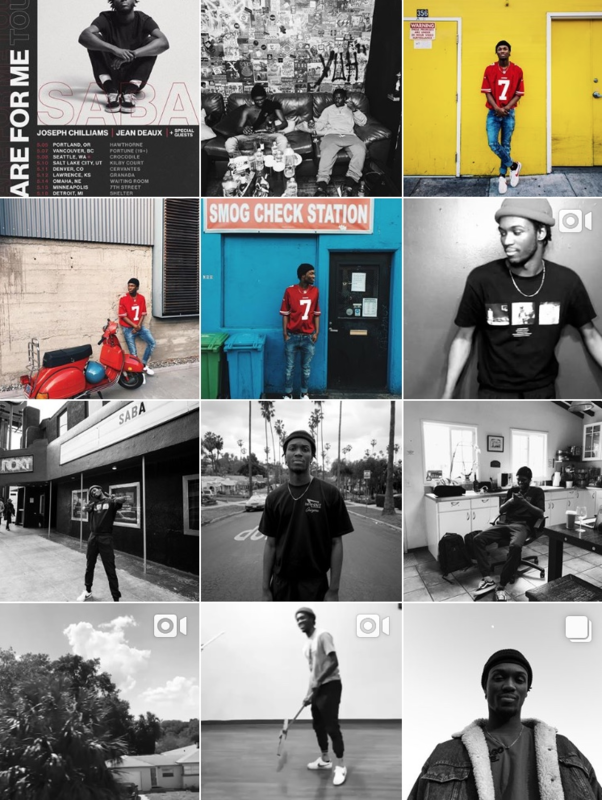 A similar color scheme dominates the rapper’s Instagram profile. This aesthetic stays consistent, even for tour announcements (see top left) and other promotional posts. Anderson .Paak has cultivated a legendary reputation in the Instagram world. He collaborates directly with collage artist Simone Cihlar and videographer Israel Ramos. Resultantly, his entire profile grid has transformed into a cohesive, ever-evolving mosaic of photos and videos. Unlike Instagram timelines and profiles, Instagram Stories keep it casual, tailored for direct-to-fan updates. Stories also helps amplify traditional posts with additional assets for tours and music releases. 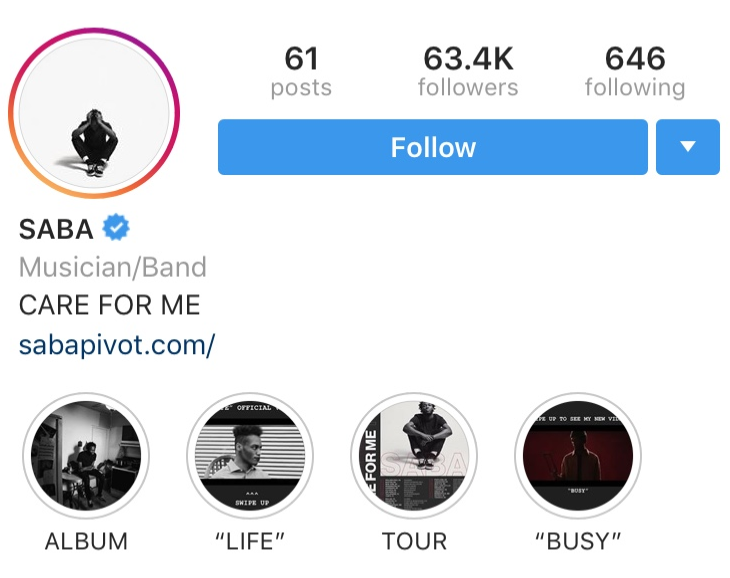 Saba has done this by saving and highlighting select Stories related to his shows and videos at the top of his profile. More importantly, Instagram Stories helps directly turn social engagement into streaming revenue. 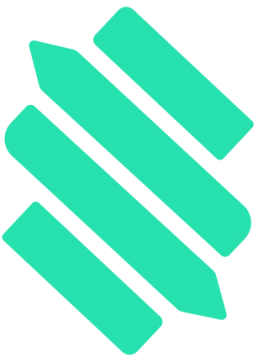 For example, the platform just revealed a deep third-party integration with Spotify. Among other things, the integration will allow Instagram users to post screenshots and stickers of songs, albums and playlists from Spotify directly to their Stories. When you post a Spotify song to your Story, viewers then have the option to click a “Play on Spotify” hyperlink. As a whole, the integration makes sharing your music (and others’) on Instagram easier than ever, not to mention opening up entirely new opportunities for legal user-generated content and music virality. It’s important to note that streaming and social media coexist in an integrated ecosystem. Resultantly, artists can leverage tools like Stem to determine, via data, how social media campaigns impact their bottom line. For example, Stem allows you to visualize month-over-month catalog performance at a glance, on both a global and regional level. This data can help gauge the effectiveness of any given social-media push (say, a big Instagram ad spend in support of a new single). It can help users run better-targeted campaigns accordingly around the world. Stay tuned for next week’s social media guide, which will focus on strategies geared toward Instagram’s parent company, Facebook.